Severe delays have been reported on the A27 and A259 this evening. 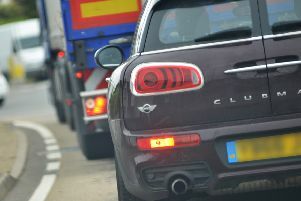 Traffic reports indicate there are delays of up to 20 minutes on the A27 westbound from the Lancing Manor roundabout back as far as Portslade. On the A259, traffic reports suggest there are long delays eastbound between Worthing and Shoreham, possibly due to the temporary traffic lights in Lancing. A spokesman for Sussex Police was not aware of any police activity along either of these roads.